Clear, multi-lingual signs and information desks make Japanese airports easy to navigate. 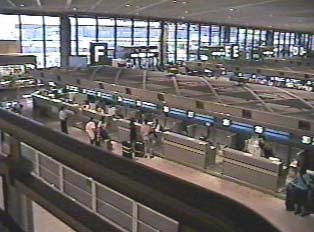 The main airports in Japan are the New Tokyo International Airport, Kansai International Airport, and Haneda Airport. Airports tend to be spacious and clean, with a wide variety of restaurants, coffeeshops, and stores for the traveler's convenience. One can reach the airports by train, bus, or taxi. Some stations have express trains to the airport that are convenient, fast, and reliable. Many travelers use the reasonably priced luggage transport services that deliver heavy luggage to a specified destination within a single day. This kind of service is especially popular among those traveling by train. Information regarding lugguage transport services can be picked up at the airport.